A consequence of the precession is a changing pole star. Currently Polaris is extremely well-suited to mark the position of the north celestial pole, as Polaris is a moderately bright star with a visual magnitude of 2.1 (variable), and it is located within a half degree of the pole. The brilliant Vega in the constellation Lyra is often touted as the best north star (it fulfilled that role around 12000 BC and will do so again around the year AD 14000), however it never comes closer than 5° to the pole. When Polaris becomes the north star again around 27800 AD, due to its proper motion it then will be farther away from the pole than it is now, while in 23600 BC it came closer to the pole. It is more difficult to find the south celestial pole in the sky at this moment, as that area is a particularly bland portion of the sky, and the nominal south pole star is Sigma Octantis, which with magnitude 5.5 is barely visible to the naked eye even under ideal conditions. That will change from the eightieth to the ninetieth centuries, however, when the south celestial pole travels through the False Cross. This situation also is seen on a star map. The orientation of the south pole is moving toward the Southern Cross constellation. For the last 2,000 years or so, the Southern Cross has nicely pointed to the south pole. By consequence, the constellation is no longer visible from subtropical northern latitudes, as it was in the time of the ancient Greeks. North_Star A candidate for navigation northward must be viewable from Earth and circumpolar to the north celestial pole. The current one is Polaris. It is the star at the end of the "handle" of the Little Dipper asterism in the constellation Ursa Minor. Gamma Cephei (also known as Alrai, situated at 45 light-years away) will become closer to the northern celestial pole than Polaris around 3000 AD, and be at its closest approach around 4000 AD. The "title" then will pass to Iota Cephei (ι Cephei, situated 115 light-years away) some time around 5200 AD. The first magnitude star Vega (26 light-years away) will then become the North Star by 14000 AD. Currently, there is no South Star as useful as Polaris; the faint star σ Octantis is closest to the south celestial pole. However, the constellation Crux, the Southern Cross, points towards the south pole. It is known as 畢宿五 (Bìxiùwŭ, the Fifth Star of the Net) in Chinese. Aldebaran is identified as the lunar mansion Rohini in Hindu astronomy and as one of the twenty-seven daughters of Daksha and the wife of the god Chandra. Aldebaran and another star, Antares, in the constellation Scorpius lies almost exactly opposite it in the sky, forming an almost perfect line, or axis through the heavens. Spica, and Regulus are the other two bright stars noted for their helpful nearness to the ecliptic which gives us the zodiac. Velikovsky [ 1895 - 1979] is best known as the author of a number of controversial books reinterpreting the events of ancient history, in particular the US bestseller Worlds in Collision, published in 1950. We are all attracted to the brightest stars. It is in our DNA. This has always been the case. For as long as we know, navigators have known how to determine their latitude — their position north or south of the equator. At the North Pole, which is 90 degrees latitude, Polaris (the North Star) is directly overhead at an altitude of 90 degrees. At the equator, which is zero degrees latitude, Polaris is on the horizon with zero degrees altitude. In ancient times, the navigator who was planning to sail out of sight of land would simply measure the altitude of Polaris as he left homeport, in today’s terms measuring the latitude of home port. To return after a long voyage, he needed only to sail north or south, as appropriate, to bring Polaris to the altitude of home port, then turn left or right as as appropriate and "sail down the latitude," keeping Polaris at a constant angle. Pole stars are often used in celestial navigation. While other stars' positions change throughout the night, the pole stars' position in the sky essentially do not. Therefore, they are a dependable indicator of the direction toward its respective pole. Due to the precession of the equinoxes the direction of the Earth's axis is very slowly but constantly changing, and as the projection of the Earth's axis moves around the celestial sphere over the millennia, the role of North Star passes from one star to another. Since the precession of the equinoxes is so slow, a single star typically holds that title for many centuries. The brightest of all the fixed stars is Sirius. Known to astronomers as Alpha Canis Major, it is the principal star of the constellation Canis Major (the Big Dog). The ancient Egyptians called it Septit, the Hebrews knew it as Sihor, to the Greeks as Sothis and also as the "the Dog Star" that followed Orion the Hunter. Sirius has a magnitude of -1.42, which makes it nine times more brilliant than a standard first magnitude star. If you go back on time to look at the sky at the time of the first helical rising at the Dog star that was at 4323 BC you'll find out that it was, the end age of Gemini and the beginning of age of Taurus. 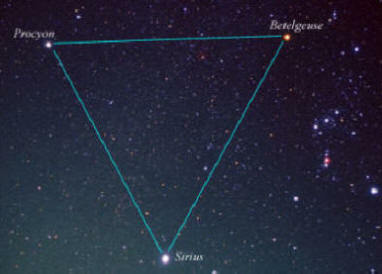 The well-regulated equilateral triangle is formed from Betelgeuse in Orion, Sirius in Canis Major, and Procyon in Canis Minor is called the Great Winter Triange and can be easily detected in urban areas. However, the constellation of Monoceros, the Unicorn, within the Triangle is often overlooked. In ancient times during the height of the summer from the 3rd of July to the 11th of August, Sirius rose into the sky at the same time as the sun. People thought the days were made hotter by Sirius, the Dog Star, that it's brightness added to the Sun's energy, producing the additional warmth. Hence the title "the dog days of summer". While the ancient Egyptians built sundials to keep track of daylight hours, during the night they measured the movement of the stars across certain portions of the sky. They associated their goddess Isis, "the lady of all the elements, the beginning of all time" with the brightest star in the night sky, Sirius. "Your sister Isis comes to you rejoicing for love of you. You have placed her on your phallus and your seed issues in her, she being ready as Sirius, and Horus Sopd (a star) has come forth from you as Horus who is in Sirius…"
They built temples facing the point on the eastern horizon where Sirius first appeared before sunrise. Ancient Egyptian astronomers, tracking Sirius for their calendar, started a new year at the first new moon following the appearance of Sirius and all awaited the annual floods that irrigated the land. New Year's Day, which occurred on or near summer solstice, was heralded by Sirius, brightest star in the sky and great benefactor of Egypt, rising before the Sun. This momentous event "opened the year," announcing the annual inundation of Egypt as the life-giving waters of the Nile flood, gift of Isis, returned renew the parched valley after the season of dryness. New Moon festivals were also significant at this time. Throughout the ancient Egyptian civilisation the celebration of the birth of the divine child, Horus, from the womb of the goddess Isis was commemorated at the opening of the New Year when the star Sirius rose heliacally at dawn. But because of the effect of precession, the event shifted along the calendar at approximately the rate of 8.5 days every 1000 years. Each year the sun returns to the same place in the sky a quarter of a day later. We employ a leap year, adding a day every fourth year to adjust. The ancient Egyptians used two cycles: a "vague" civil year of 365 days, and a "fixed" sacred year, marked by the return of Sirius to the same place in the sky, in exactly 365 1/4 days. "The Egyptians celebrated the Dog Star's rising with the Sun as the beginning of the year, for it coincided with the annual flooding and refertilization of the Nile River." Orion the Giant Hunter or Warrior, he was a giant so tall that he could wade through any sea, His first marriage ended when the boastfulness of his first wife got her banished to the underworld. He was blinded by a jealous father when he fell in love with a Greek princess, but regained his sight when an oracle told him to look into the sun at dawn. When he saw Aurora the goddess of dawn, they fell in love. All was well until Orion was stung by a Scorpion, he fell sick and died. In order to honor him and protect him from his enemy he rises in the east as his enemy, the Scorpion sets in the West. Orion is never seen at the same time as the Scorpion. Orion was used to predict the seasons, a midnight rising of Orion meant that the grapes were ready to harvest, a morning rising meant that Summer was beginning, and an evening rising that winter is here. During the construction of the Great Pyramid the "North Star" of the period was α-Draconis, also known as Thuban, though it was 2° away from true North at the time of Khufu. However, rather than the use of one star, Spence proposes that two circumpolar stars were used, and that an imaginary chord was drawn between the two as they rotated about celestial North. When the two stars are vertically aligned, an alignment with the stars of a plumb-line will be exactly oriented to true North. Then, because of precession, this method will become increasingly inaccurate with time. Ursa Minor or the Little Dipper Constellation points to the North Star although this will change after some centuries due to the precession of the equinoxes. It was one of the 48 listed by Ptolemy [83 – 161 AD]. and is called the Little Dipper because its seven brightest stars seem to form a ladle, or dipper shape. The four stars in the "bowl" of the little dipper are unusual in that they are of second, third, fourth and fifth magnitude. Hence they provide an easy guide to determining what magnitude stars are visible, useful for city dwellers or testing your eyesight. The handle of the Dipper is the Little Bear's tail and the Dipper's cup is the Bear's flank. The Little Dipper is not a constellation itself, but an asterism, which is a distinctive group of stars. Another famous asterism is the Big Dipper in the constellation Ursa Major. To many ancient cultures Ursa Minor was the Hole in which the earth's axle found its bearing. The star at the end of the dipper handle is Polaris, the North Star. Polaris can also be found by following a line through the two stars which form the end of the "bowl" of the Big Dipper, a nearby asterism found in the constellation Ursa Major. Because the Earth's axis is precessing , Polaris is only temporarily at the North Pole. In about 13,000 years, Vega will be the North Star and another 13,000 years after that, it will be Polaris again. Precession is caused by the the gravitational attraction of the Sun and the Moon. It only happens because the Earth is not quite spherical. Ursa Major extends its influence over a period of time that spans parts of the Piscean Age and as well as the Aquarian Age. Some might say the constellation Ursa Minor is ushering in the zodiacal Age of Aquarius. The North Celestial Pole had great significance to the ancient navigators and astronomers who measured heavenly motions. Knowing the motions of the heavens could determine whether a sailor could get back to home port or not. 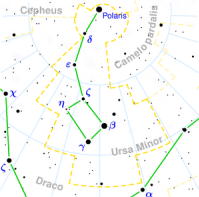 Phoenician sailors used the North Star Polaris for celestial navigation giving Ursa Minor importance as the box-like body and tail of the smaller bear pointed to the North Star. The North star (pole star) also changes with the precession of the equinoxes. The North star was Thuban (Alpha Draconis) when the Great Pyramid was constructed to align with true North. The descending passage of the Great Pyramid points to Thuban, the most accurately aligned pole star of all the North stars in the 25,800-year cycle of our Earth. The ancient Persians called Polaris the "turning point star" 5,000 years before it became our current pole star between the sixth and seventh ages. The Christian saint Jerome called the Virgin Mary by the title of Stella Maris which means: 'The star of the sea', referring to the starring role that Polaris has for sailors. Polaris has always been a symbol of virtue and chaste women because it is the most constant and faithful star in the sky. The axis of the earth is slowly moving from pointing towards Polaris to pointing in the direction of another star: the star, Vega . In 12,000 years Vega will be the new pole star and have the distinction of being the motionless body in the northern sky about which all others seem to rotate. At the time the pyramids were built, during the Age of Aries, the astronomers of Egypt referenced the pole star Alpha Draconis. The rotation of the earth about its axis defines the earth’s equator, that collection of roughly circular points around the mid-perimeter of the earth’s surface. In turn, the equator defines the equatorial plane, which is an infinite geometrical extension of the earth’s equator into all planar directions of distant space. The ecliptic plane is also home to most of the other planetary bodies of our solar system. Our earth, moon and the planets all make their journey around the sun in roughly the same plane. Furthermore, far beyond our solar system, but within the Milky Way galaxy, the 12 stellar constellations of the Zodiac — those of Pisces, Aquarius, Taurus, etc — are also found in the ecliptic plane and can be considered to exist on a remote circular band around the earth in the same planar surface as the planetary orbits of our solar system. Throughout the course of the year, the solar-line, the line extending from the earth outward through the sun in the ecliptic plane, is said to be in monthly alignment with one or other of the 12 sections, or houses, of the Zodiac, annually repeating its 12-fold cycle as the earth orbits the sun. Is the Big Bang dead? Space is Eternal in that it does not experience "Time"
Currently, Cosmology is obscured by an incorrect belief in the ‘Big Bang’ - that the universe is expanding, and thus had a beginning at some time in the past. As we shall explain, this is not correct, for the simple reason that the observed ‘Hubble’ redshift with distance is NOT caused by a Doppler shift due to receding Motion / expanding Universe, but rather, is caused by diminishing Wave Motion interactions with distance. Alternatively, suppose we were to accept the mythical genesis of the world from night or the natural philosophers' claim that 'all things were originally together.' We are still left with the same impossible consequence. How is everything to be set in motion, unless there is actually to be some cause of movement? Matter is not going to set itself in motion - its movement depends on a motive cause. Egypt had defined a civil year as thirty six ten day periods and one five day period known as the epagomenal days when the children of Nut the stars above the heavens and Geb arth below the heavens under the cosmic sea were born. Canis Minor - the Little Dog consists of only two stars - bright Procyon and a fainter one which means someone wanted the Big Dog to have company. Polaris is our North Star now and for another 2000 years. In ancient Egyptian times, 4,800 years ago, the star Thuban in Draco was the north star. The emerging Plasma Universe paradigm, allows us to imagine many profound implications. Mainstream science, for the most part, looks on the universe as electrically neutral and purely mechanical; a place where the weak force of gravity holds fort. Plasma Cosmology, by contrast, acknowledges the electrodynamic nature of the universe. Gravity and inertia are NOT the only forces at work. The history of science, of course, is fraught with controversy, and it is important to bear in mind that the situation today is little different. The earth's axis is tilted by 23½ degrees, which gives us two north poles, True North and Magnetic North. Recent research reported in Science suggests that Polaris is 2.5 times brighter today than when Ptolemy observed it (now 2mag, antiquity 3mag). The astronomer Edward Guinan considers this to be a remarkable rate of change and is on record as saying that "If the y are real, these changes are 100 times larger than [those] predicted by current theories of stellar evolution." If you look out to the east when the sky is dark during the fall months, you will see one of the most famous and beautiful star groupings in the sky. It looks like a small faint question mark, made up of stars. This star grouping, or cluster, is the Pleiades (pronounced PLEE-uh-deez), or Seven Sisters. The Pleiades are located within the constellation Taurus, the Bull, and represent the bullís shoulder. In Greek mythology, Taurus represented the king of the gods, Zeus, who disguised himself as a white bull with golden horns to attract the beautiful maiden, Europa. When Europa seated herself on the bullís back, he swam away with her to Crete, which is why we see only the animalís head and forequarters in the constellation. "Frequently consider the connection of all things in the Universe. ... Reflect upon the multitude of bodily and mental events taking place in the same brief time, simultaneously in every one of us and so you will not be surprised that many more events, or rather all things that come to pass, exist simultaneously in the one and entire unity, which we call the Universe. ... We should not say ‘I am an Athenian’ or ‘I am a Roman’ but ‘I am a Citizen of the Universe'. " "There is the legend of the 'Three Kings of the Orient' who came on Christmas to adorn the new-born God… from days of old the Three Kings were the three conspicuous stars in the belt of Orion… that so easily distinguishes this notable constellation… and their title was for long the Three Kings of Orion… They point almost in a direct line to the following…Sirius (which) was made in the type of Christ-soul in mankind. (Sirius) is preceded by the Three Kings who anticipate its coming (rising)…"
Sirius @ astro. wisc.edu Sirius is the brightest star in the sky, after the Sun. 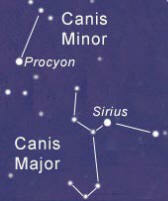 Take a look at the list of the Brightest Stars Canis Major is one of Orion's hunting dogs. and holds Sirius often called the Dog Star.